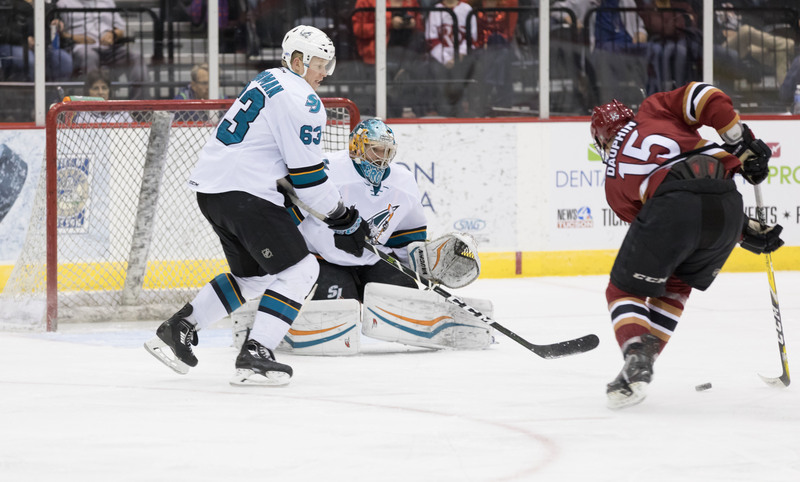 The Roadrunners hung tight with the San Jose Barracuda for the second consecutive night, and this time around, were able to pocket a point in their 4-3 overtime loss Saturday evening at Tucson Arena. Unfortunately, though, the club has momentarily been pushed outside of the playoff picture due to the Bakersfield Condors’ 3-1 victory over the Stockton Heat. After a scoreless first period, Mitch Moroz netted his first goal in a Roadrunners uniform to give Tucson a 1-0 lead just over two minutes into the middle frame. Moroz, skating in hard on a forecheck, won a battle for a puck behind San Jose’s net, curled around the right side and snuck a shot past Troy Grosenick. San Jose’s Marcus Sorenson responded with two goals of his own to give the Barracuda a 2-1 lead heading into the third. Early in the third, Kyle Wood slammed home the Roadrunners’ second goal of the evening, a power play marker from the left circle to tie the score 2-2. Just over two minutes later, Laurent Dauphin scored his third goal of the weekend when he executed a nifty move to deter San Jose’s defense on an offensive zone attack, eventually beating Troy Grosenick with a move to his backhand. With 2:04 left to play in regulation, Nikolay Goldobin tied the game 3-3. 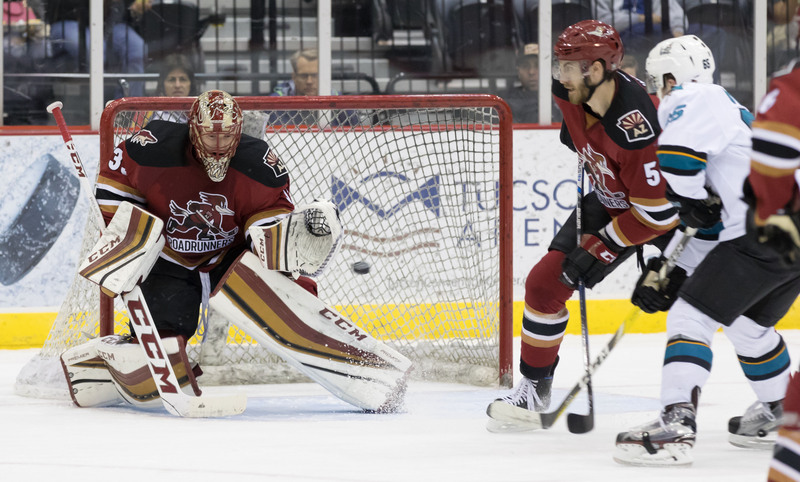 The Roadrunners killed off a five-on-three situation late in the third period that carried into overtime. The Barracuda, though, scored shortly thereafter, Tim Meier’s tally at the 1:46 mark of the extra frame securing a 4-3 win for San Jose. Adin Hill, after a tumultuous 36 hours of travel to and from Dallas to serve an emergency back up role for the Coyotes, made 34 saves. The Roadrunners will complete their three-game home stand Tuesday night when they host the San Diego Gulls at Tucson Arena, where the puck is scheduled to drop just after 7:05 PM.